Sodexo, Inc. and Starship Technologies recently launched robot food delivery services at George Mason University’s Fairfax, Va. campus. 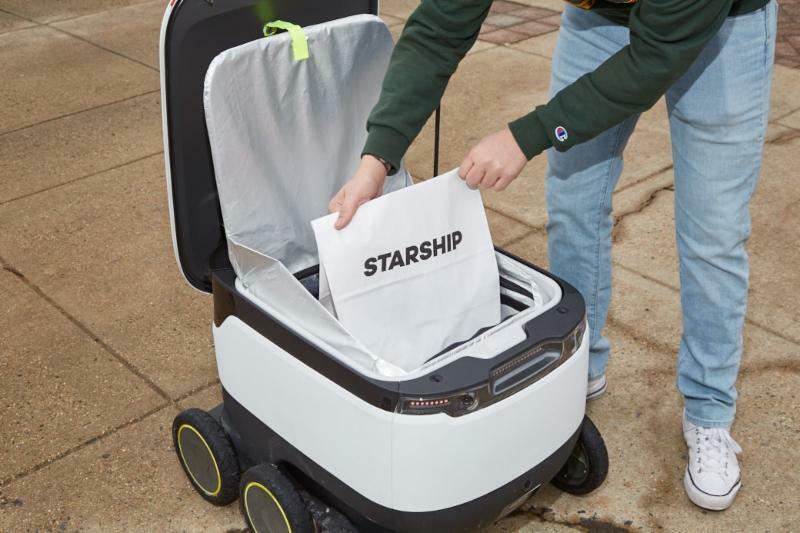 Mason’s 40,000 students, faculty and staff can access the Starship deliveries app to order food and drinks to be delivered anywhere on campus, within minutes. Blaze Pizza, Starbucks, Dunkin’ and 2nd Stop, a Sodexo-branded campus grocery store, are the first retailers to participate, with more to be announced. Each on-demand delivery costs just $1.99. With a fleet of more than 25 robots at launch, this initiative is the largest implementation of autonomous robot food delivery services on a university campus and is representative of Sodexo’s next-generation technology portfolio for the college and university market. The service works in conjunction with student meal plans. “We’re excited that our students, faculty and staff get to be at the forefront of this pioneering campus food delivery service,” said Mark Kraner, executive director for campus retail operations at George Mason University. To get started, users open the Starship deliveries app, choose from a range of their favorite food or drink items, then drop a pin where they want their delivery to be sent. They can then watch as the robot makes its journey to them, via an interactive map. Once the robot arrives, they receive an alert, and can then meet and unlock it through the app. The entire delivery usually takes 15 minutes or less, depending on the menu items ordered and the distance the robot must travel. Each robot can carry up to 20 pounds – the equivalent of about three shopping bags of goods. Starship Technologies operates commercially on a daily basis around the world. Its robots have completed over 25,000 deliveries and traveled more than 150,000 miles. The robots use a combination of sophisticated machine learning, artificial intelligence and sensors to travel on sidewalks and navigate around obstacles. The computer vision-based navigation helps the robots to map their environment to the nearest inch. The robots can cross streets, climb curbs, travel at night and operate in both rain and snow. In addition, the robots can be stored in pods located around campus where their batteries are automatically switched so they can continue to operate independently, with no human involvement. “University dining programs are evolving their strategies to meet this generation’s elevated expectations, such as better quality, variety and service delivery,” said Jim Jenkins, CEO, Universities East, Sodexo North America.